There are two major delusions/misconceptions about paying for college that too many parents have. The first is that by not saving for college, parents claim this will make their kids eligible for more financial aid. Why bother saving if it means they won’t get any financial aid? This falls into the delusional category. I generally give people the benefit of the doubt but I can’t help but think this has more to do with preferring to spend money now rather than saving for later. Oh, FYI, financial aid doesn’t work that way. The second is really a misconception that I can’t fault parents for having-scholarships will pay for college. By the senior year in high school, there’s every reason for parents to believe that their bright, high achieving seniors will be able to pay for college if they just apply for enough scholarships. There are easily a dozen different websites just to search for millions of scholarships worth billions of dollars. So what exactly is my problem with private scholarships? Honestly, I don’t have anything against free money and if you get one-more power to you. But the truth about scholarships is that they will come nowhere close to paying for college for the vast majority of people. It’s simply a matter of numbers. First, let’s be clear on what I’m referring to as a private scholarship. These are scholarships that are not awarded by the school or any government agency. These are scholarships that students apply for that are sponsored by corporations, non-profits, and community groups. In fact, a survey by Accounting Principles found that a third of college graduates would have actively pursed more scholarships and financial aid options knowing what they now know about the cost of living. Which goes to show while they obviously have learned something about debt, they haven’t learned much about scholarships or how to pay for college. It’s not likely the numbers have changed much since then. The College Board’s Trends in Student Aid 2017 report found lists “Private and Employer Grants” as making up 6% of all undergraduate student aid and 10% of all grant aid. This is more than the number provided by the NSPA study. However, this includes employer tuition reimbursement programs which are likely to be at least half of the category. You could take this information as an argument that students aren’t applying for enough scholarships. After all, the NSPA study states the amount of aid that went unawarded “may be approximately $100 million annually.” If only students would take the time to apply! I’m not saying it couldn’t happen but be prepared to submit a lot of scholarship applications. Let’s start with the average cost of attendance for college. A good state school is going to be around $25,000 a year while a private school is going to set you back a minimum of $45,000. Now how much are these private scholarships offering? Forbes has a list of the “10 High Dollar Award Scholarships for College.” There’s the Buick Achiever’s Scholarship Program that offers a multi-year $25,000 scholarship-that’s singular, as in one person gets it. An additional 1,000 students will receive a one-time award of $2,000. So probably at least 1 in 1000 odds? There’s the National Merit Scholarships where “At Auburn University hundreds of students apply for 6 elite scholarships which range from $2,500 – $7,500 per year over four years.” Room and board almost covered! National finalists in The Siemens Math, Science and Technology Award Scholarships receive awards that range “from a low of $10,000 to a high of $100,000 for the first place winner.” Again, what are the odds? I could go on through all 10 programs but the conclusion would still be the same, there is probably more competition for any medium to high value scholarship award than there is to get into Harvard. Any scholarship that a lot of people know about will have a lot of people applying. Your best shot at a private scholarship is to go for the local ones that come through your high school guidance counselors’ office. Not as much competition but also not as much money. It’s going to take a lot of $500 scholarships to start making a dent in just your state tuition. Of course, there are people who do collect enough scholarships to make it the equivalent of a full-time job. But they are definitely the exception rather than the rule. Students eligible for need-based financial aid need to check with their schools for their policy on out-side scholarships. After a minimum amount, many schools will deduct the outside scholarship from any need-based financial aid awards. Ideally, the school will use the outside scholarship to reduce the loan amounts first, but that isn’t always the case. You can read about a case at Swarthmore here. Maryland has passed a law that will prevent public colleges from practicing Scholarship Displacement. And just in case you’re wondering, students must report outside scholarships to the financial aid office. So yes, in a worst case scenario, students can work hard for outside scholarships only to find that none of it can be used to reduced their EFC. If you want to see how mess-up the system can get, read Poor Scholars Hit by Money Squeeze From Wealthy Colleges. My problem isn’t with private scholarships but with the suggestion that if only students applied to enough of them, they would be able to pay for college or avoid large amounts of debt. Of course there will be some students who receive enough scholarships to pay for college. And if you have time to apply for scholarships, you should. 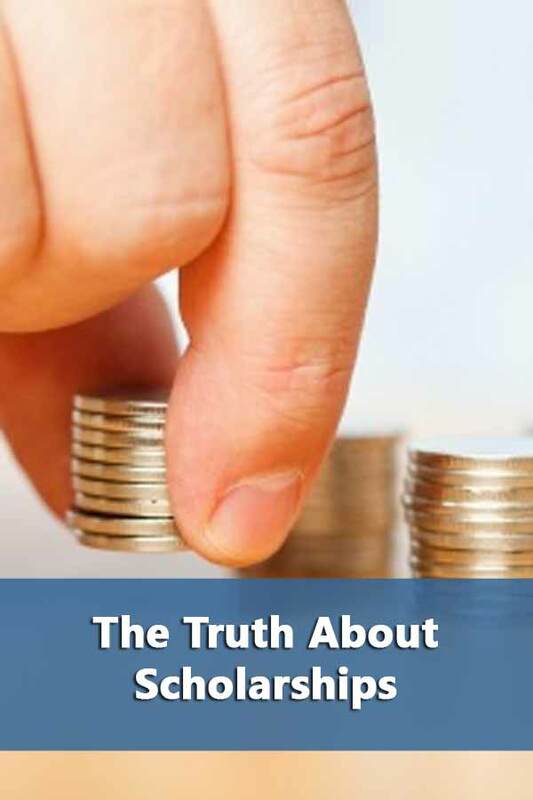 But the truth about scholarships is that most students would be better off if they used their time figuring out which schools are most likely to give them the most money before they ever even apply for admissions or scholarships. This matches up with what I’ve personally heard; the best bet is the scholarship the college you attend will give you. I know one stellar student, with lots of unique extracurriculars, who applied for 100 outside scholarships and received only one, for something like $1500.